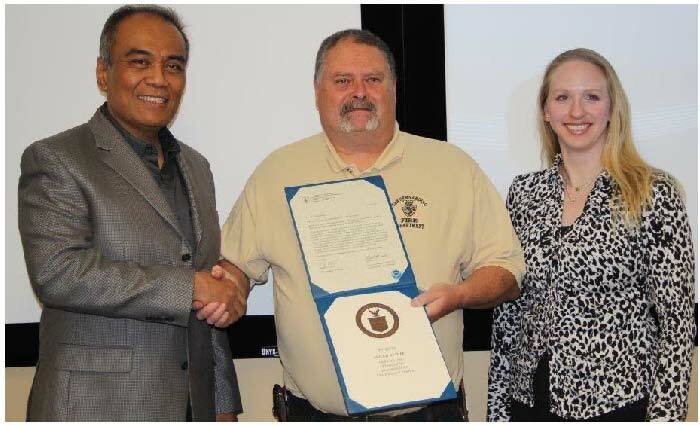 The National Weather Service in San Diego recently presented Hesperia resident Phillip Dupree with an award for his 15 years of service to the Cooperative Observing Program. Noel Isla, Observing Program Leader, Mike Watkins, Hydrometeorological Technician, and Tina Stall, Meteorologist Intern, traveled to the High Desert Emergency Operations Center in Hesperia to make the presentation. Mr. Dupree is a dedicated Sky-warn coordinator for San Bernardino County and has been reporting the daily temperatures and precipitation from his home in Hesperia for the past 15 years. He also provides vital reports to the Weather Forecast Office during storms, fires, plane crashes, and more. Mr. Dupree is proud of his many years of service in weather support, and looks forward to contributing further in the future. Members of the High Desert EOC and San Bernardino County Fire Department were also in attendance, and presented Mr. Dupree with their own award for his dedicated weather support services.